SKU: 6812100 Categories: Anatomicals Under Eye Care, Face Care, Popular, Quick add ons, The Mama with Attitude, The Sleep Deprived Mama, The Soap Opera Mama. Tags: €10 & under, bags, eye patches, patches, puffy eye patches, puffy eyes, Puffy The Eye Bag Slayer. You know the blood curdling screams your hear in horror films when vampires sink their teeth into the white fleshed necks of virginal nieces of 18th century noblemen? well, they’re the same blood curdling screams that can be heard when young ladies (as this is the 21st century, let’s skip the virginal bit) who have bitten off more than they can chew party wise, stare in the mirror at their pale, drawn complexions and baggy, tired eyes. if you’re one such young lady and have always wished there was a product to make you look less (un)dead, then these collagen eye patches are the Count’s (as in Dracula) cojones. It is with hearts full of sadness that we announce that we are consciously uncoupling from the dark circles and tired looking eyes. 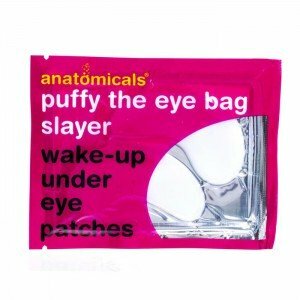 There is another party involved – it is called ‘Puffy The Eye Bag Slayer – Wake-Up Under Eye Patches’. We ask for privacy at this time to allow us to lie down, apply the patches and chill out. We thank you for your understanding. 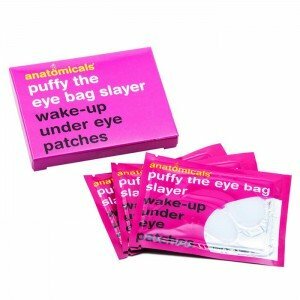 Anatomicals Puffy the Eye Bag Slayer Under Eye Patches will help you look alive and refreshed. Don’t panic if you have a big event after a big night out, the collagen eye patches will make your tired eyes look awake! The Anatomicals puffy eye patches are filled with vitamins and collagen to help reduce dark circles, reduce puffiness and is enriched with moisturising agents which help to prevent under eye aging. You may have had a late one, the night before a big interview but don’t let your eyes give you away! 1) Cleanse and thoroughly dry your face. 2) After opening the foil package, peel off the plastic liner. For best results use the patches immediately after opening. 3) Apply the patches as shown in the illustrations Smooth the patches gently to ensure contact with the skin. 4) Wear the patches for 30 minutes. 5) Gently remove the patches.